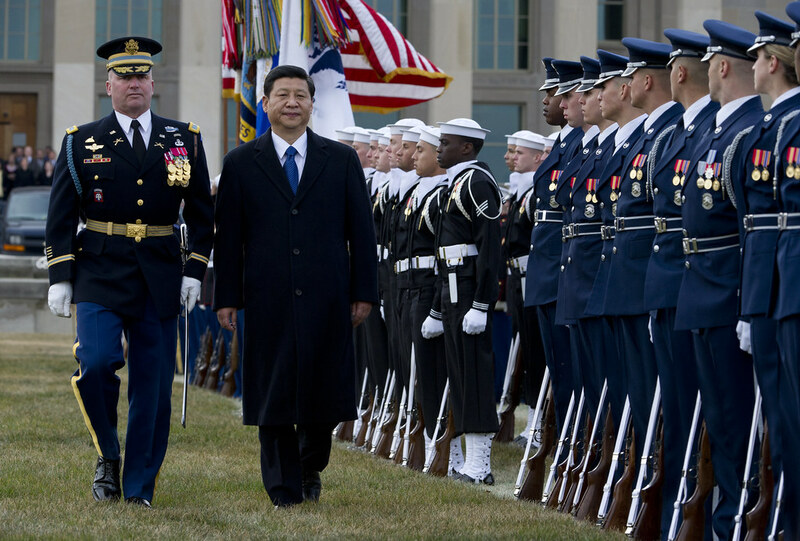 From security to the economy to human rights, China is increasingly acting as a destabilizing force in global affairs. Here are some questions President Obama needs to ask. China has unilaterally sought to change the status quo in the South China Sea by creating nearly 3,000 acres of artificial formations and making baseless assertions of sovereignty in the surrounding waters and airspace. Just this week, the Pentagon reported that another U.S. plane was nearly hit during an overly aggressive encounter with Chinese interceptors in international airspace, directly contravening the intent of a 2014 memorandum of understanding on unplanned encounters at sea and in the air. By the year's end, China is expected to deploy a ballistic missile submarine carrying nuclear missiles capable of hitting the United States. Meanwhile, the hacking of the Office of Personnel Management (OPM) and the personal information of millions of U.S. government employees has focused renewed attention on the threat of Chinese cyber espionage. 1. In 2013, China, pushing against the norms of nation-state behavior, unilaterally declared an Air Defense Identification Zone (ADIZ) over the East China Sea. The United States and its allies rejected this illegitimate declaration, and the U.S. promptly flew military aircraft through the designated zone. Will China continue this destabilizing behavior and declare a similar ADIZ in the South China Sea, as many observers have speculated in recent months? 2. President Xi, China's behavior in numerous territorial disputes, including the East and South China Seas, has violated the spirit of the United Nations Convention on the Law of the Sea (UNCLOS), of which China is a signatory. While the United States has not ratified this treaty, the U.S. Navy strictly adheres to its principles. Does China's failure to abide by an international treaty to which it is a party undermine the rule of law and established international norms? Will China abide by UNCLOS arbitration and peacefully resolve territorial claims in the South China Seas? 3. Hawkish Chinese military leaders have spoken about a long-term naval presence from the Indian Ocean to the Mediterranean Sea, despite Beijing's long-standing claim that it is focused on national defense and not interested in bases overseas. Does this public discussion of broader naval deployment signal a shift in China's defense priorities? 4. The status quo in the Taiwan Strait is the existence of two legitimate governments. One, the Republic of China (Taiwan), is a liberal democracy. The other, the People’s Republic of China, is an autocracy under the control of the Chinese Communist Party. Applying your One Country, Two Systems narrative to U.S.-Taiwan relations, how can you claim the right to represent 23 million people on Taiwan who enjoy popular sovereignty? 5. Chinese leaders have spoken of their desire to play a constructive role in global affairs, what former Deputy Secretary of State Robert Zoellick termed a "responsible stakeholder.” If that is Beijing's goal, will China begin using its leverage to positively resolve thorny global issues like Iran, Syria, and North Korea, or will it continue serving as the friend-of-last-resort for those rogue regimes? 6. President Xi, you have spoken of a "China Dream" for your people. Yet years of human rights abuses persist - from clampdowns on political dissent, to extra-legal detention, to torture of persons in custody. Just recently, the New York Times brought international attention to an ongoing Chinese government campaign that has ripped over a thousand crosses from Christian churches. As photos continue to surface of government workers atop cranes, wielding cutting torches to remove crosses one wonders if this “China Dream” applies to ethnic minorities like Tibetans and Uighurs and those Christians who refuse to accept state control of their religion? Or perhaps is it reserved only for Han Chinese and members in good standing of the Chinese Communist Party? 7. China has dismissed concerns about its Asian Infrastructure Investment Bank (AIIB). Yet given Beijing's longstanding support of illiberal states like Zimbabwe and Sudan, with no-strings-attached assistance, are there not genuine reasons to question China's commitment to transparency in development? 8. In an effort to restrict free expression, China erected the “Great Firewall of China,” which was developed to censure websites that provide access to news, search engines, and social networking for Chinese users. Most recently, China has even pressured American technology firms to sign a pledge requiring them to localize user data, provide encryption keys and to abide to Chinese surveillance agencies when asked for information. President Xi, do you think China can claim global economic leadership while still stifling the internet freedom required in a dynamic global economy? 9. President Xi, your government has instituted controversial initiatives to enable Chinese businesses, many of which are state owned enterprises, to compete in the global marketplace; however, there are numerous examples showing China instituting strong regulatory mechanisms to disadvantage foreign competitors by stealing their intellectual property and preventing Chinese internet users from accessing online services and content. Do you believe that China has upheld its commitments, particularly regarding intellectual property, made in 2001 to join the World Trade Organization? 10. As China continues to aggressively manipulate its currency, in an effort to sustain its economic growth and demand for its cheaper goods, its strategy has begun to shed light on the detrimental impact it could have on global markets. Do you think such practices are in line with China's stated commitment to a robust and rules based global trading environment? These questions are offered to provide a basis for President Obama to speak openly with the most powerful decision-maker in a country whose policies are increasingly undermining the rules-based international order that has prevailed since World War II. From security to the economy to human rights, China is increasingly acting as a destabilizing force in global affairs. If the United States is to ensure that the current free, prosperous, and peaceful global order prevails, we must begin by speaking clearly and truthfully about the challenges China is posing to that system. What better opportunity than some frank talk over dinner?